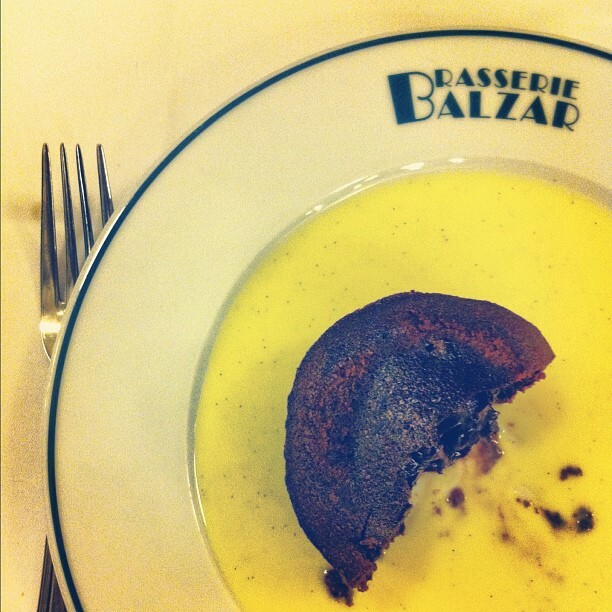 Moelleux au chocolat; the inspiration came from Paris. Mark George recommended Brasserie Balzar, a Paris institution on the Rue des Ecoles near the Sorbonne whose waiters are très charmant. Creature of habit I am, my order was the same in April 2011 with Jim as in January 2012 on a solo trip: french onion soup, warm goat cheese salad, and this magical molten chocolate dessert. Of the few recipes I've tried, the Cooks Illustrated one below wins. (Most delicious. Most melty. Most perfect.) It's gooey on the inside, tastes of pure chocolate, and is best served warm with a dollop of homemade whipped cream. I served it to Stuart & Asen, as well as Ashley & Lee. It freezes incredibly well, and can be made ahead of time to easily bake during the meal. Try it? 1. Adjust oven rack to middle position and heat oven to 400 degrees. Grease eight 6-oz ramekins and dust with cocoa. Arrange ramekins on rimmed baking sheet. Melt butter and chocolate in medium heatproof bowl set over saucepan filled with 1 inch of barely simmering water, stirring once or twice, until smooth. Remove from heat. 2. Using stand mixer fitted with whisk, whip eggs, egg yolk, sugar, vanilla, and salt on high speed until volume nearly triples, color is very light, and mixture drops from beaters in smooth, thick stream, about 5 minutes. 4. Bake until cakes have puffed about 1/2 inch above rims of ramekins, have thin crust on top, and jiggle slightly at center when ramekins are shaken very gently, 12 to 13 minutes. Run knife around inside edges of ramekins to loosen cakes, invert onto individual serving plates, and let sit until cakes release themselves from ramekins, about 1 minute. Lift off ramekins, dust with confectioners' sugar, if using, and/or top with homemade whipped cream (spoonful granulated sugar, drop of vanilla and 1/2 - 3/4 c. heavy whipping cream, whisked heavily or beaten in stand mixer).